Discussion in 'Online Games - News and Reviews' started by Marina, May 31, 2015.
isn’t any ordinary slot machine, as is the case with many of Microgaming’s quality slots. Not only is it the first slot game for the Samsung Galaxy Gear 2 (or any wearable for that matter), it is Bane-sized fun! it plays a montage of scenes from the movie. This adds quite a bit of fun to the game. The game’s excitement is taken up a notch with the music that sounds like it came right from Hans Zimmer’s movie score. scatter symbol (the bomb) and one wild (The Dark Knight Rises logo). The wild is able to stand in for any symbol but the bomb. increasing your wins. Another random occurrence has the symbols on the reels re-arrange to give you the maximum possible payout for that spin. Overall, it’s an incredibly exciting game that can pay out big. Any Bat-fan, or fan of winning a good game of slots, should check this game out! War Machine, Iron Patriot, the Iron Man logo, Tony’s arc reactor, an Extremis soldier, the Mandarin, and the basic 9, 10, J, Q, and K. The game does have some music, but it’s somewhat repetitive and quiet. The arc reactor acts as a basic wild and the Iron Man logo is the scatter. The wilds seem surprisingly regular, which is nice, while the Iron Man scatter symbol shows up somewhat rarely. huge amount of scatter possibilities, which can mean some significant wins. spins and random wilds, which can potentially add a significant amount of wilds to the board. 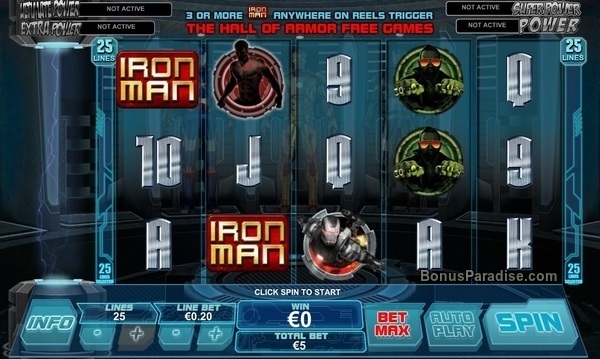 The Iron Patriot, in my opinion, has the worst bonus, giving you fifteen spins and a dynamic multiplier. Frankly, I would rather win a lot more often than maybe get lucky with the multiplier and get lucky with the spin. As far as money goes, the game goes long lengths of time without producing wins, giving the house a significant edge. The big advantage that the Marvel games have over other games, though, is the progressive Marvel jackpot that has the potential to pay out huge amounts of money. Overall, the game is a fair game but doesn’t have the pizzazz of some of the other movie-themed slots with movie clips and frequent big wins. 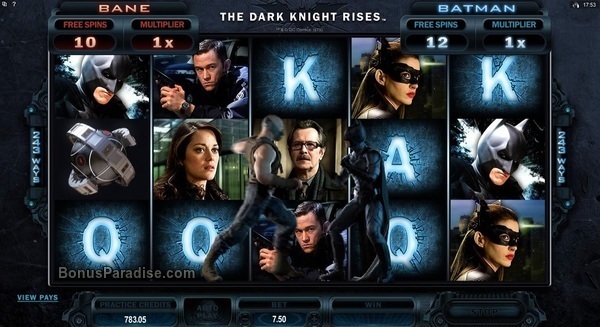 The Dark Knight Rises slot is really a nice video slot to play! I also love the Batman Slot!!! It is one of my favorite Microgaming Games!